can begin drenching their plants during the dormant season. continue drenching at three to four week periods. seven days before the freeze to permit time for the plant to absorb The Solution. extended for five +/- days. Tomato freshness can be extended for weeks. NOTE: These solutions carry the highest EPA rating.... the "Bio Preferred" label. 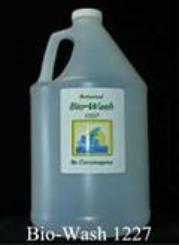 The Bio-Wash Soap is blended in five (5) basic formulas. • Within the United States, we ship 25% to most consumers. • For large farms, distributors and foreign ports, we ship 100%. For U.S consumers, we also offer Ready-to-Use (RTU) and a 25% concentrate. insects, etc differ in strength and fragility, the following “starting dilutions” are suggested. Please begin with the suggested dilutions listed below, and adjust the concentrates as needed. plants require minimum amounts; larger plants and trees require more. email us! We are here to serve you and help you get the best results possible, at the lowest cost.